This interview was previously published in December 2013 in Sculpture, 32(10), pp. 26-31 and was featured on the cover. 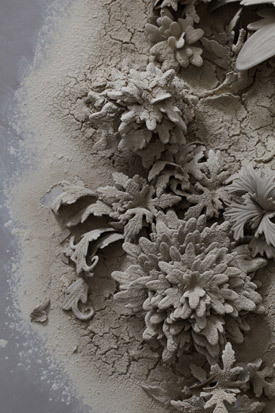 Phoebe Cummings uses unfired clay to make poetic and performative sculptures and installations that emphasize material, fragility, time, creation, and decay. Working across art, design, and ceramics, she has had a number of residencies in the United Kingdom, the United States, and Greenland, including three months as a Kohler Arts / Industry Resident (2008) and six months as the Ceramics Artist-in-Residence at the Victoria and Albert Museum (2010). She was also awarded a ceramics fellowship at London’s Camden Arts Centre (2012–13). 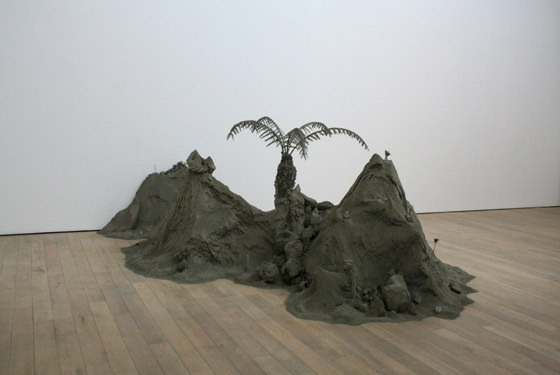 Cummings’s work has been featured in several recent group exhibitions, including “60|40 Starting Point Series” at Siobhan Davies Studios, London; “Formed Thoughts” at Jerwood Space, London; and “Swept Away: Dust, Ashes, and Dirt in Contemporary Art and Design” at the Museum of Arts and Design, New York. In 2011, she won the British Ceramics Biennial Award. In 2013, she had a solo show at the University of Hawaii Art Gallery in Honolulu. Her educational background includes studying three-dimensional crafts at the University of Brighton and an MA in Ceramics & Glass from the Royal College of Art (2005). She lives and works in Stafford, England, north of Birmingham. R.J. Preece: [As I mentioned earlier, I’ve written a bit on Mark Pimlott’s crossover work between art and design, and some of the challenges he has faced over the years.] How has it been for you working across disciplines? Is it an advantage or disadvantage? Have there been any issues in terms of residencies, exhibition opportunities, or commissions? Phoebe Cummings: This territory between disciplines really interests me, and my emphasis fluctuates with each individual project. Ceramic objects are historically an interesting meeting point of craft, art, design, science, and industry. The interplay of all of these aspects is embedded in my practice, but with a different outcome. The temporary nature of my work— and building directly on site— means that residencies have been particularly suitable to my process. The lack of a permanent object does present issues, however; the work cannot easily be transported or sold in a conventional way, which closes certain opportunities. At the same time though, it opens up a range of other exciting possibilities. R.J. Preece: Clare Twomey, another artist who works with clay in unconventional ways, has written about your work, “Unfired and uncaring of this state, the work is fragile and alive, seeking a dialogue of the precious and the vulnerable…The work absorbs all it encounters and does it with little regard for permanence and sentimentality toward preservation of the object.” (Clare Twomey, “The Work of Phoebe Cummings,” Down there among the roots, exhibition catalogue, Newlyn Art Gallery, Cornwall, 2011.) Is she referring to a specific group of works or all of your works? Phoebe Cummings: All of my works use clay in this way. There are often very detailed elements, and the making involves labor-intensive processes, regardless of the brief existence of the piece. There is an absurdity to investing so much time and energy into something that will dissolve and break back down into raw material, but that is also what interests me. It says something about life, death, and being human. “Sentimentality” is an interesting word: I am often asked if I am sad when the work is destroyed. I think this is specific to our expectation of experiencing an object—that there should be an emotional response to its loss rather than an emphasis on our experience of it. There is always a desire to possess and contain, whereas we are comfortable with performance being momentary. What draws me to work with clay is that it changes, and it has the potential for endless remaking. Phoebe Cummings. Cella, (2013). Raw clay, wood, wire mesh, 36 x 108 x 384 in. Installed at University of Hawaii Art Gallery, Honolulu, 2013. Photo by Brandon Ng. Courtesy University of Hawaii Art Gallery. R.J. Preece: Could you tell me about Cella (2013)? Was it easy to suspend the work as you did? 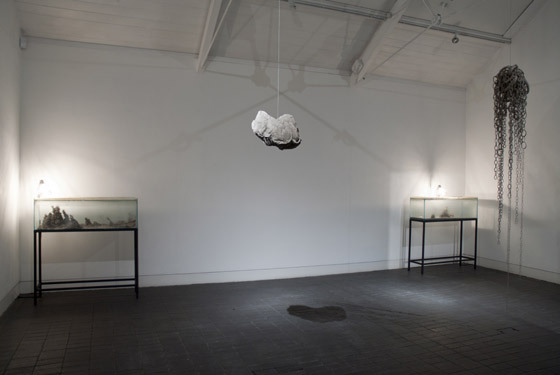 Phoebe Cummings: I’m interested in how making in suspended space alters the relationship between your body and the object. It began with works that I made at Siobhan Davies Studios and then at Jerwood Space. With Cella, I wanted to create a sense of standing inside the material: How does it feel to have one and a half tons of clay above your head? Cella is my largest work to date, and suspending that amount of clay presented a number of challenges. You are always working against gravity, so the construction of the piece is really important— breaking it down and applying the clay in smaller sections to allow for shrinkage rather than cracking. The piece was made over three weeks with the help of students from the University of Hawaii. It was a new experience to work like that, to not be in control of the whole making process. Phoebe Cummings. Phoebe Cummings. Between, (2005). Stoneware sprayed with porcelain. 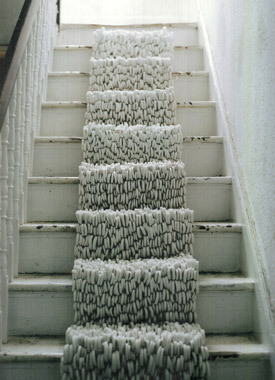 Installed in a domestic interior, London, 2005. Photo courtesy the artist. The texture was created by forcing the clay through a fine wire mesh, and we handmade more than 250,000 pieces of texture to cover the surface of the piece. Constructing the work felt something like insect activity or industrial production. It was incredibly labor intensive, and the time involved created an additional sense of weight, a kind of transference of energy. R.J. Preece: How did you make Between (2005)? How did you “spray” porcelain? I was interested in objects and the domestic interior, thinking about the stairway as a space between up and down, private and public, somewhere we pass through. The work was about creating an avoided or impossible object; it was my first temporary work that would remain only as a photograph, or memory. Phoebe Cummings. Beneath, (2007). Raw clay, approx. 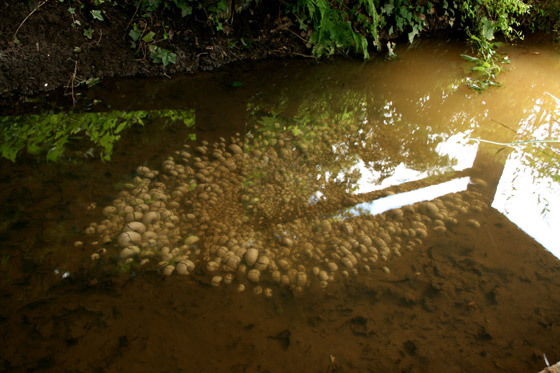 1 m x 1.6 m. Installed under water in the boat house at Bolwick Hall, near Amersham, Norfolk, England, 2007. Photo courtesy the artist. R.J. Preece: How did you install Beneath (2007) under water? Phoebe Cummings: It was in a shallow area at the edge of a lake inside a boathouse. The water was quite still and clear. Since the water didn’t move the piece too much, the clay dissolved slowly rather than washing away. I made it in sections and lowered it into the water immediately after it was made, balancing on a plank of wood across the water. Dry clay would have dissolved almost instantly, losing its shape; wet clay, on the other hand, becomes soft, but tends to hold its shape unless disturbed. 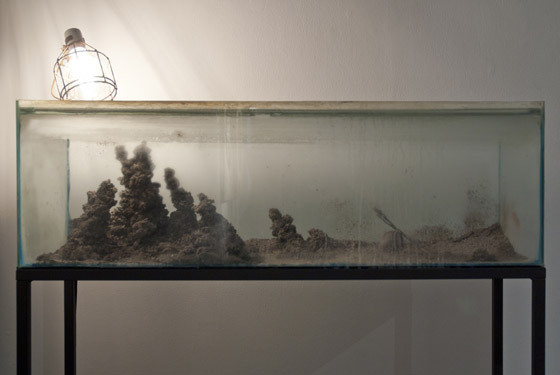 The piece lasted about a month before dissolving completely and sinking into the sediment. R.J. Preece: Tell me about your 2008 residency with the John Michael Kohler Arts Center. Phoebe Cummings: Kohler Co. is a bathroom manufacturer, and the Arts / Industry Program has been running for 40 years through the John Michael Kohler Arts Center. The residency provides artists with studios within the factory and access to industrial facilities and materials. There are usually two artists in the pottery and two in the iron foundry. I’ve visited ceramics factories before, but I’ve never experienced production on this scale. It was amazing to work in that environment and to see the skills of the Kohler associates. R.J. Preece: Do you have advice for other artists on engaging with design and industry? Phoebe Cummings: The Kohler residency, which is a great opportunity to work in this way, has an open call for applications. There are also a number of residencies in China. If you have an idea, it can be worthwhile to approach relevant companies directly. The worst that can happen is no reply. I took part in an “artists into industry” seminar during the British Ceramics Biennial (BCB) in 2009, and it was interesting to hear from different companies that are open to working with artists. BCB is continuing to create opportunities for artists to work with industry in the U.K.
R.J. Preece: What influences feed into your work? Phoebe Cummings: Historical ceramics play a part, particularly Meissen porcelains and Paleolithic clay sculptures found in the Tuc d’Audobert caves in France. Richard Long’s A line made by walking is significant in how slight and brief it is and in terms of the act of making. I saw an exhibition of Russian landscape painting at the National Gallery in London in 2004, which had a big impact— the sense of scale and emptiness. Books provide perhaps the biggest influence; J.G. Ballard’s The drowned world and W.G. Sebald’s The rings of Saturn have been particularly important to me. Phoebe Cummings. Border, (detail) (2011). Raw clay, cement. Installed at Newlyn Art Gallery, Newlyn, Cornwall, England, 2011. Photo courtesy the artist. R.J. Preece: How does Border (2011) relate to landscape? What kind of micro-world is there? Phoebe Cummings: Border was made in Cornwall and looked specifically to the landscape there, drawing out different details of its history. From a distance, the work appears like a landscape, but it is not the Cornish landscape. Instead, the details are rearranged with shifts in scale—from life-size to miniature. Border was installed with a sound piece by Chris Watson [a founding member of Cabaret Voltaire, known for his recordings of the natural world]. Visually, the piece had a sense of moving in and out of frequency, like sound. Phoebe Cummings. Detail from untitled installation in residency studio, Victoria & Albert Museum, London, (2010). Photo: Sylvain Deleu. Photo courtesy the artist. R.J. Preece: How did you make the floral elements in your V&A residency installation? Phoebe Cummings: Each leaf and petal shape is taken from a printed or painted surface decoration on an object in the collection. I then modeled the shape in clay and made a plaster sprig mold. Sprig molds are usually used to apply low-relief surface decoration to ceramic objects— Wedgwood, for example. From the molds, I pressed out separate leaves / petals and then built them together as three-dimensional pieces. Phoebe Cummings: Vanitas was made for “Formed Thoughts,” an exhibition that considered relationships between maker and material. The two glass cases set up micro-environments in which the clay was left to change, almost as a material performance. The suspended piece involved equal quantities of clay, each preventing the other from breaking on the floor. The chains were made entirely of clay, and so it was uncertain how long they would become. Phoebe Cummings. Vanitas installation, (2012). Raw clay, steel, glass, dimensions variable. Jerwood Space, London 2012. Photo: Tomas Rydin. Photo courtesy of the artist. I had to wait for the moment when the clay was strong enough to take its own weight, but not so dry that it would shatter when handled. The suspended material existed as a kind of still-life— hovering above loss— while the enclosed glass environments considered transience and cycles of life. Phoebe Cummings. Detail from Vanitas installation, (2012). Jerwood Space, London, 2012. Photo Tomas Rydin. Photo courtesy of the artist.